New York is the theatrical epicenter of the world; you can pretty much find every kind of experience imaginable here. So imagine how cool and unique Fuerza Bruta is that there is legit nothing else like it. Their latest show is a full-out party—from dancing in the rain to bonding with strangers as you lose your $hit. Below, BroadwayBox shares the 10 biggest WTF moments we saw while watching the trailer for Fuerza Bruta. 1. Just walking on water. NBD! 2. Her and whatever she's up to up there. 3. This guy defying gravity. 4. Just look at that thing spin, and that's happening directly above the audience. 5. Someone gets picked up from the crowd and then flies Spider-Man Turn Off the Dark-style. 7. Is it New Year's Eve in Times Square? No? 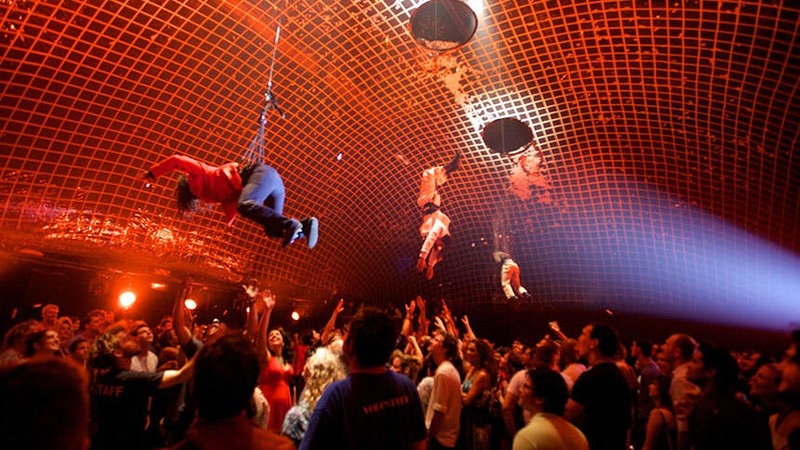 Just a typical night at Fuerza Bruta. 9. Then breaks through a wall like the Hulk or something. 10. Big finale: dance party inside but still in the rain/it's raining inside. Check out the full trailer below, and experience Fuerza Bruta live at off-Broadway’s Daryl Roth Theatre. What If Rob Marshall Made His Follies Film Using Only Actors He’s Worked With Before?